BOTOX® treats adults with the OAB symptoms of leaking, going too often, and the strong sudden need to go. Patients receiving BOTOX® reported a significant reduction in the number of their daily leakage episodes. The Results Speak for Themselves click here to learn more. BOTOX® treatment works by calming the nerves that trigger the overactive bladder muscle. In your body, certain chemicals travel from nerve cells to muscle cells to make your bladder contract so that you can urinate. With OAB, these muscles contract uncontrollably, creating leakage, the strong sudden need to go, and going too often. Treat the strong need to urinate right away. Reduce the number of times that you need to empty your bladder daily. BOTOX® begins to work at the source of your Overactive Bladder to reduce daily leakage episodes after just 2 weeks. BOTOX® is not a daily treatment. In clinical trials, one BOTOX® treatment provided up to 6 months of OAB symptom improvement. (Your results may vary.) Talk to your doctor about your re-treatment timing, waiting at least 3 months between treatments. When Should I Consider BOTOX® as Treatment? Anticholinergic medications do not work well enough or are too difficult to tolerate. How are BOTOX® Treatments Administered? Once you and your doctor decide that BOTOX® is right for you, very often it can be administered in your Urologist’s office. Your doctor will prescribe an antibiotic to prevent against a urinary tract infection. The week prior to your procedure your doctor will order a urine culture to ensure you do not have an infection. Your doctor will numb your bladder for a more comfortable treatment. Once your bladder is numb, a small lighted tube called a cystoscope will be inserted through the urethra (the natural opening where the urine comes out). BOTOX® is injected through the cystoscope into multiple areas of your bladder muscle. The entire process takes approximately one hour: 30 minutes to prepare and administer the BOTOX® and 30 minutes for post-procedure evaluation. You will be scheduled for a follow up visit after your procedure for a post void residual to ensure you are emptying your bladder. You should not experience significant pain after the BOTOX® treatment, although it may sting or burn when you urinate the first few times. You may also see some blood in the urine right after treatment, but significant bleeding is rare. See your doctor if either of these symptoms persist. Other side effects of BOTOX® include: urinary tract infection, painful urination, and/or inability to empty your bladder on your own. If you have difficulty fully emptying your bladder after receiving BOTOX®, you may need to use disposable self-catheters to empty your bladder up to a few times each day until your bladder is able to start emptying again. Other side effects include dry mouth, discomfort or pain at the injection site, tiredness, headache, neck pain, and eye problems: double vision, blurred vision, decreased eyesight, drooping eyelids, swelling of your eyelids, and dry eyes. The availability of BOTOX® for the treatment of overactive bladder is important news for those who have tried other medications but still experience urge urinary incontinence – or leakage from the bladder. For those patients who have not found adequate relief or can’t tolerate the side effects after taking an anticholinergic medicine, BOTOX® may be a treatment option. BOTOX® calms muscle contractions by temporarily blocking the transmission of nerve impulses to the bladder muscle. 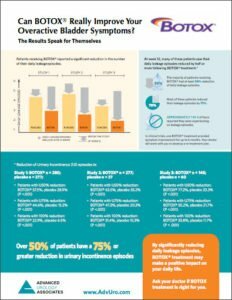 The most common side effects reported with BOTOX® treatment in the clinical studies included: urinary tract infection (18%, vs. 6% with placebo), dysuria (9%, vs. 7% with placebo), which means painful or difficult urination; and urinary retention (6%, vs. 0% with placebo), which is a temporary inability to fully empty the bladder requiring clean intermittent catheterization.1 Clean intermittent catheterization is a way to manage incomplete bladder emptying.5 The patient will only need to insert the catheter when they need to drain urine and then remove it after use. Patients with diabetes mellitus treated with BOTOX® were more likely to develop urinary retention than non-diabetics. As with any medical treatment, it’s important to talk to your doctor about all the potential side effects as well as benefits, to evaluate if BOTOX® might be an option for you. 1 BOTOX® (onabotulinumtoxinA) Prescribing Information, updated January 2013. 2 Stewart WF, Van Rooyen JB, Cundiff GW, et al. Prevalence and burden of overactive bladder in the United States. World J Urol 2003:20:327-336; based on 2010 U.S. Census data and U.S. adult population [as of Jan 10, 2013]. 3 National Patient Count, IMS Total Patient Tracker, USC 24100, MAT 11/12. 5 Wyndaele JJ, et al. Neurourol Urodyn. 2010;29(4):662-669.